The official Russian announcement said he resigned. Western diplomats think the red carpet was pulled from under the most traveled Soviet leader in history. 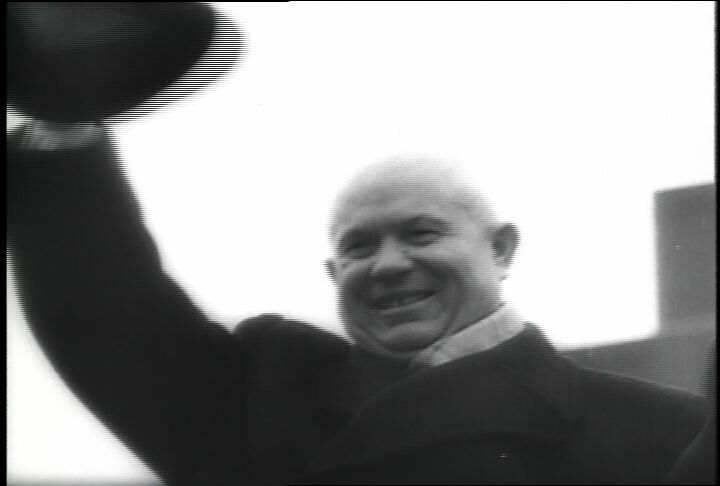 Khrushchev, the man who clawed and fought his way to the top is shown in some of his trips outside the USSR. With MacMillan and Nasser. With Chinese Communist leaders and at the United Nations where he tried to purge the Secretary General and made a spectacle of himself. Now, Leonid Brezhnev and Aleksei Kosygin have split the top jobs between them for better or for worse, the Khrushchev era is at an end. President Carter comes to office determined to reduce the number of nuclear weapons and to improve relations with the Soviet Union. His frustrations are as grand as his intentions. Carter had hoped the United States and the Soviet Union would reduce their reliance on nuclear weapons. He stopped production of the B-1 bomber. He believed the SALT II negotiations would be a step toward eliminating nuclear weapons. But his intentions were frustrated by Soviet actions and by a lack of consensus among his own advisors, including Chief SALT II negotiator Paul Warnke and national security advisor Zbigniew Brzezinski (who was dubious about arms control). Carter balanced Soviet aggression in Africa by improving American relations with China. He withdrew SALT II treaty from Senate consideration but its terms continued to serve as general limits on strategic nuclear force levels for both the United States and the Soviet Union. Chicago: “War and Peace in the Nuclear Age; Carter's New World; Khrushchev Resigns,” 10/15/1964, WGBH Media Library & Archives, accessed April 25, 2019, http://openvault.wgbh.org/catalog/V_12BCEE081C434C52B98B81A5D2F22948. MLA: “War and Peace in the Nuclear Age; Carter's New World; Khrushchev Resigns.” 10/15/1964. WGBH Media Library & Archives. Web. April 25, 2019. <http://openvault.wgbh.org/catalog/V_12BCEE081C434C52B98B81A5D2F22948>.